I am happy to pass along information about the Association for the Study of the Cuban Economy (ASCE) Webinar Series for 2018. 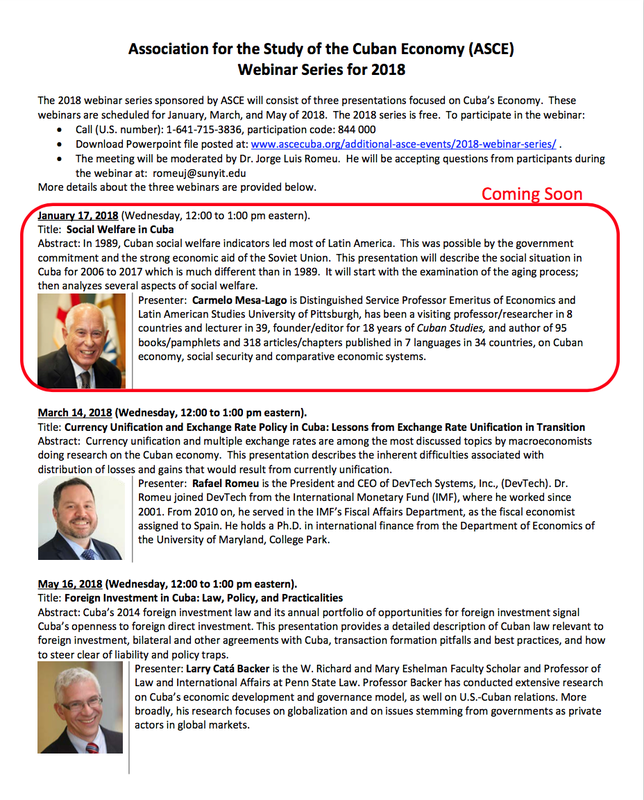 Carmelo Mesa, Distinguished Service Professor Emeritus of Economics and Latin American Studies University of Pittsburgh, will open the series with a Webinair entitled, "Social Welfare in Cuba. The Webinar Series can be accessed HERE. Abstract: In 1989, Cuban social welfare indicators led most of Latin America. This was possible by the government commitment and the strong economic aid of the Soviet Union. This presentation will describe the social situation in Cuba for 2006 to 2017 which is much different than in 1989. It will start with the examination of the aging process; then analyzes several aspects of social welfare. Presenter: Carmelo Mesa-Lago is Distinguished Service Professor Emeritus of Economics and Latin American Studies University of Pittsburgh, has been a visiting professor/researcher in 8 countries and lecturer in 39, founder/editor for 18 years of Cuban Studies, and author of 95 books/pamphlets and 318 articles/chapters published in 7 languages in 34 countries, on Cuban economy, social security and comparative economic systems. 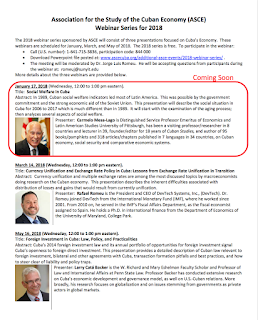 Abstract: Currency unification and multiple exchange rates are among the most discussed topics by macroeconomists doing research on the Cuban economy. This presentation describes the inherent difficulties associated with distribution of losses and gains that would result from currently unification. Presenter: Rafael Romeu is the President and CEO of DevTech Systems, Inc., (DevTech). Dr. Romeu joined DevTech from the International Monetary Fund (IMF), where he worked since 2001. From 2010 on, he served in the IMF’s Fiscal Affairs Department, as the fiscal economist assigned to Spain. He holds a Ph.D. in international finance from the Department of Economics of the University of Maryland, College Park. May 16, 2018 (Wednesday, 12:00 to 1:00 pm eastern). Abstract: Cuba’s 2014 foreign investment law and its annual portfolio of opportunities for foreign investment signal Cuba’s openness to foreign direct investment. This presentation provides a detailed description of Cuban law relevant to foreign investment, bilateral and other agreements with Cuba, transaction formation pitfalls and best practices, and how to steer clear of liability and policy traps. Presenter: Larry Catá Backer is the W. Richard and Mary Eshelman Faculty Scholar and Professor of Law and International Affairs at Penn State Law. Professor Backer has conducted extensive research on Cuba’s economic development and governance model, as well on U.S.-Cuban relations. More broadly, his research focuses on globalization and on issues stemming from governments as private actors in global markets.